East End is not a real fire company. We are a group of firemen that enjoy going to parades, promoting the fire service, and making children smile - while having a good time in the process. April 1998 is deemed the official founding of East End Volunteers. After purchasing a 1973 Mack fire pumper and laboring many hours on its restoration, the suggestion was made that we give ourselves a name. After all, we were a group of firefighters from the same geographical area, with similar interests and beliefs. The name East End kind of just happened, probably because the engine is quartered on the "East End" of town. The engine's lime green color reminded one member of the comic book hero - "The Incredible Hulk." Hence, the "Hulk", adorned in black turnouts and a black leather helmet, and toting a set of irons was adopted as our mascot. Our motto, "Beast of the East" came just as easy and was derived from our location, our mascot, and the reputation of Mack fire apparatus. Currently, East End boasts 25 "official" members and many more supporters. Collectively, we have over 150 years of fire service experience. The majority of our firefighting members are certified to the Firefighter II level and even as high as Fire Officer V.
At East End, there is no distinguishment between career and volunteer. All of our members are believers in those principles on which the fire service was built: pride, tradition, dedication, professionalism, respect, service to the community, training, and being forward thinking. Unfortunately, with the passing of older members, many of today's fire departments have abandoned these thoughts. We are a group striving to show they still exist. Engine 3 was originally purchased by the Upper Allen Township Fire Company (Station 23) of Cumberland County, PA. The engine was delivered around December of 1972. 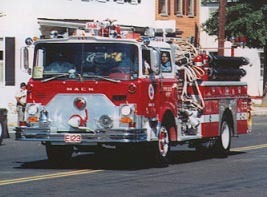 Originally, Engine 323 was painted all red. After several years of front-line service and with the purchase of newer apparatus, Engine 323 was demoted to 2nd due engine. During this time the engine also received a more popular paint scheme - white over red, and was given the designation Engine 123. With the expected purchase of a more modern fire pumper, the decision was made to sell Engine 123. While nearly 20 years old, Engine 123 was a fully functional piece of firefighting apparatus, and would no doubt be an attractive find for another department. In 1992, the Engine 123 was sold to the Rawlinsville Volunteer Fire Company (Station 5-8) of Lancaster County, PA for approximately $25,000. Almost immediately, Rawlinsville had the engine painted it's traditional white over lime green color scheme and made some minor additions including a chrome vertical exhaust stack. Engine 583 served this department well, running as the front line pumper on nearly all responses. Not only did the engine carry the traditional firefighting equipment, but also a full complement of rescue tools. However, in the Fall of 1997, while returning from an auto fire, a vehicle struck Engine 583 in the front end. 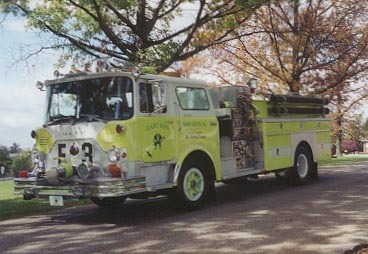 The engine was kept in service, but since Rawlinsville was in the market for a new pumper anyway, the decision was made to sell the Mack rather than pay to repair it. In the early months of 1998, the Gibney family of Fawn Grove saw the Engine advertised for sale in the Pennsylvania Fireman. They submitted a bid and later found out that they were the only ones who had. 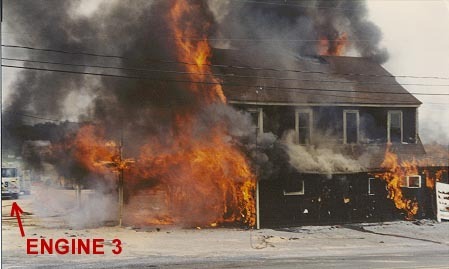 Engine 3 was picked up from Rawlinsville on the evening of 24 April 98. Since taking ownership of the rig, the Gibney family, with the help of many friends, community members, and local business owners, has completed two separate refurbs of the apparatus. The first refurb began immediately after taking delivery of the rig. The primary objective was to fix the accident damaged front end to make the engine "parade worthy". This refurb was completed using a lot of used Mack parts from Interstate Truck Equipment in Hagerstown, MD and was finished just in time for the 9th Annual Olde Tyme Days Parade in Fawn Grove. The engine was taken to several parades that first year and even won a few prizes. However, Engine 3 still was showing its age with some rust spots and other blemishes. So in the Spring of 1999, East End enlisted the help of Gary Thompson, James Grimes, and Jerry Anderson. Gary cut out some rust areas and fabricated a few new compartment doors. James helped the members prep and apply a fresh coat of lime green paint on the areas that needed it. Finally, Jerry Anderson and his graphics company lettered the rig with some brand new personalized decals. Engine 3 was finished just in time for the 24th Annual PA Pump Primers Parade & Muster in Harrisburg, PA. Our hard work paid off as Engine 3 was awarded 2nd Best Appearing Antique Fire Engine in its class, competing against fire apparatus from all over the state. East End hopes the 2000 parade season will bring us continued success and enjoyment.